He’s already made an Arduino compatible SD card reader board he calls I2SD (it speaks I2C) that also speaks TTL serial, so it would be perfect. I’m putting the Auto-programmer on hold to make …. drum roll please…. The Boot Drive for Arduino! I promised a blow by blow, and I’ve been working on this for a couple of sessions. I’ve read through all the docs (8 bit stk500 protocol, optiboot source code, AVRDUDE source.) and It looks fairly straight forward. Essentially the “programming arduino” stands in for the IDE. The optiboot source code is pretty cleanly documented (used in most newer arduinos, like the UNO). It’s pretty tiny and does only the bare minimum to get the job done. Since it’s fairly stateless (not completely, as there are timeouts that cause you to jump to the user program), I needed to get an idea of the actual sequence. I downloaded a trial version of AGG Software’s Advanced Serial Port Monitor which lets you “listen in” on the conversation between a computer (i.e. 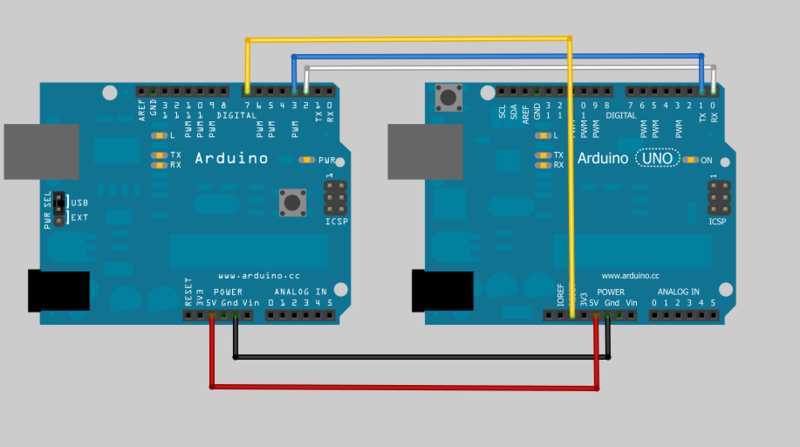 the Arduino IDE) and a device (the Arduino.) I collected sample program downloads for the UNO and for the Duemilanove (they have different bootloaders). There were no surprises, but it was nice to confirm the sequence. If people are interested, I could post about this later. Drop me a line on my Google+ stream. Here’s how I have it wired (using regular Arduinos until I can get my hands on an I2SD). Note I haven’t set up the Adafruit MicroSD breakout board yet. I’ve got pins 2 and 3 configured as software serial on the “Master” Arduino hooked in a null modem configuration with pins 0 and 1 of the “Target” Arduino. I chose to do this, so I can send debugging info down the USB serial channel. I’m doing this at 115200, because that’s what the UNO bootloader operates at. I also hooked a digital pin from the Master to the Reset of the Target. If I read the code correctly, you have a very short period of time to start sending STK500 commands before the bootloader times out and jumps to user code after RESET. The Arduino IDE asserts reset by toggling the RTS line (well, actually a software call on the USB-serial driver). The RTS output of the FTDI chip (or equivalent on the UNO) is tied to RESET. Now comes the frustrating part, I haven’t been able to get them to talk. I get bytes back but they aren’t what I expect, and I’m not sure where they are coming from if I’m not properly entering the bootloader. I also tried setting up dummy programs, the Target sending “Hello” in a loop, and the “Master just trying to receive it and print it out. That doesn’t work either. I’ll keep you posted. I’m also going to try talking to a TTL serial Arduino clone (one of the WIBLOCKS Pico boards).